I just went through about 25 different kinds of bacon at my small grocery store. ONE didn't have "sugar" included. Dinner: One avocado, half a pound of bacon. 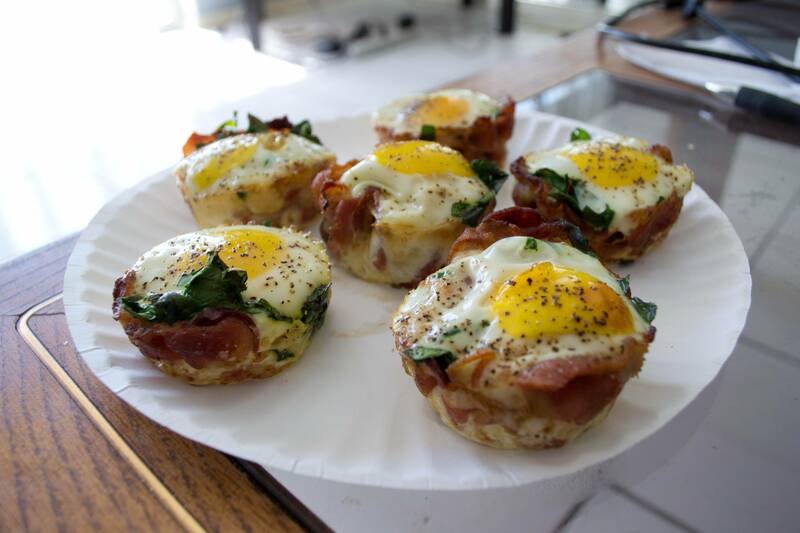 I need to get muffin trays to make these (egg + bacon + whatever). UCSF scientists declare war on sugar in food (today). Opinion: Why we should regulate sugar like alcohol - CNN, yesterday. The decision that we should consume less fat (which resulted in consuming more sugar to compensate for loss of taste) was based on research that showed that high fat consumption highly correlated to obesity. Fine. But in the same research they said that it also correlated to high sucrose*, but explained that away as being only an artifact of sucrose consumption being highly correlated to fat consumption. And then our liver converts that sugar to fat in our blood, which is where all the cholesterol and stuff comes from. Source is the same video as last time. Fructose: Large quantities naturally in fruit juice (but not bad in the fruit because they come with plenty of fiber). High Fructose Corn Syrup: Obvious, but in everything. * Pretty sure it was sucrose (table sugar, cane sugar), but need to confirm. It not only completely fails to trigger your body's awareness that you have eaten enough, but it actively inhibits it, making your brain think you're starving. Which has caused us a lot of problems, because it's in everything. It's similarly bad in High Fructose Corn Syrup and sucrose (labeled "sugar", cane sugar, "real sugar"), but glucose is fine because the feedback loop works fine. Lactose is fine. Robert H. Lustig, MD, UCSF Professor of Pediatrics in the Division of Endocrinology. Has a great graph showing what happens when, primarily, he gets obese kids to stop drinking anything but water and milk (instead of soda and juice). They stop being obese. Got the video from a blog on the subject. I've been consuming lots of HFCS again lately. Tonight my dinner was a whole avocado (man that was decadent), sweet potato (with butter), and chicken breast (with salt). With lots of leftovers for tomorrow.